Have you heard someone talking enthusiastically about finding sea glass or beach glass? Have you wondered what it is? Well, beach glass is shards of glass that have been rolled and tumbled in the sea or large bodies of water over a period of time, resulting in a unique rounded and frosted-looking "gem". Through the natural actions of sun, waves, and the elements, the discarded glass is transformed into delightful jewels. 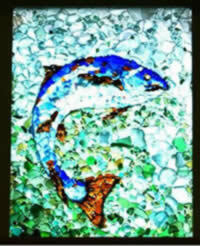 Beach glass is one of the few items of trash that is naturally recycled into an object of beauty and value. There has to be a source of glass to get onto the beach in the first place or else you won't find any. There also has to be a certain type of land contour that keeps glass get on the beach in the waterline without being buried deeply. Wave action is extremely important in rounding and etching the glass. The combination of these factors will help you determine if a beach would be a good place for finding beach glass. However, have an open mind - we have been surprised thinking a place should have glass and there wasn't much or the opposite: Thinking there wouldn't be any glass and there was. In a nutshell, the rarest colors are the yellows, oranges, and reds. 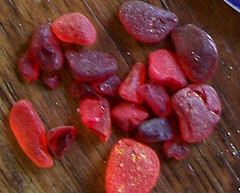 This is pretty much for everywhere; however, the other colors found in beach glass could very well depend on the location. For example, the common colors for West Beach in Washington State are white (clear), green, and brown. Here in Los Organos, Peru, the common colors seem to be various shades of blue and teal with very little white. 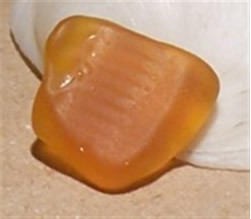 There are basically two divisions of beach glass - jewelry quality and craft quality. In order for beach glass to be jewelry quality it needs to be totally frosted, with rounded edges, and no chips or visible defects. Craft quality will have more than one rough edge, may have visible defects, and the frostiness may not be as pronounced (as some say, "not cooked enough"). Once you start looking for beach glass, be prepared to become hooked on the hobby! It's addicting, as most fan-addicts will tell you. It's like a treasure hunt every time you go to the beach. So, come on and join the fun! Scottish Fisheries Museum, Anstruther. Sea glass window by Garth Sterne. You can check out the large version here. Lin Schneider - Sea and Beach Glass Jewelry artist. 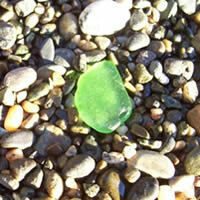 For complete details on beach glass collecting, crafts, and jewelry, visit her site at Odyssey Sea Glass.